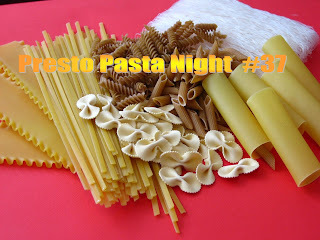 Last week I was beginning to think that people were getting tired of Presto Pasta Nights. There were only 11 great dishes to share. But this week, it seems like things are getting back on track... Nineteen delicious dishes with everything from soup to nuts. But I'll let you wander through the roundup without any more preamble. 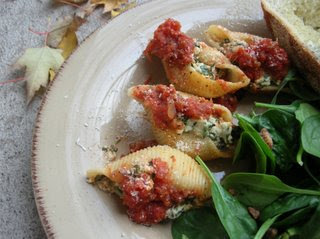 First in this week... Valli of More Than Burnt Toast brings one of my most favorite baked dishes Ricotta & Spinach Stuffed Conchiglioni (that's giant shells in English, but so much prettier sounding in Italian). The taste...awesome in any language. Sara of Cupcakemuffin got a new food processor and a new cookbook. 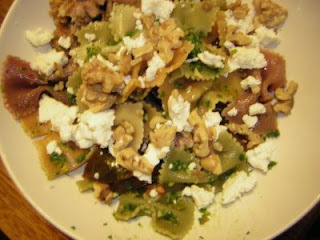 Lucky us because she sharing her Farfalle with Arugula Gremolata which looks wonderful. Amy of Life of Chad & Amy gives me hope. I love Fettuccine Alfredo, but it's way to rich for me these days (as my love handles can attest) so I'm so pleased that she shares her Alfredo - Hold the Fat version. 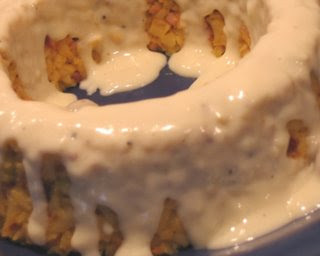 Jjoa of Journal des Demoiselles shares this intriguing Macaroni and Ham Crown. 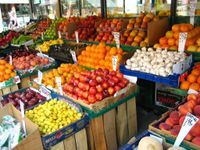 The recipe is in French, and if you have a problem, leave a comment and I'll translate. Most important words to know...couronne = crown; jambon = ham; oeuf = egg; moule = mold and délicieux = delicious! 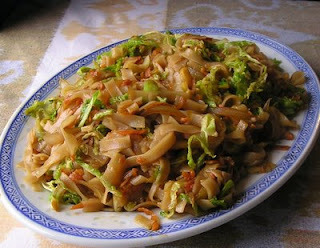 Ferdzy of SeasonalOntario Foods is back with her own version of Chinese Buffet Rice Noodles with Vegetables. I'm sure it's a winner. Do you do take out? 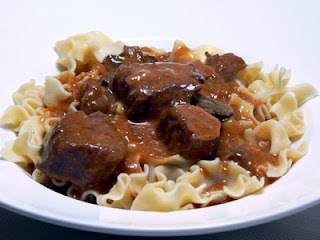 Alisha of Cook Craft Enjoy is back with a great crock pot version of Beef Stroganoff on a bed of Noodles. Looks delicious, don't you think? 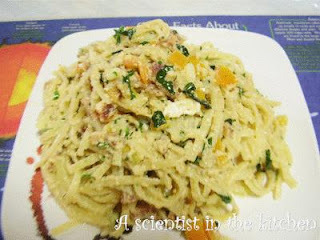 Gay, A Scientist in the Kitchen, is a first time PPNer and her dish of Creamy Linguine looks so good, I'm drooling. 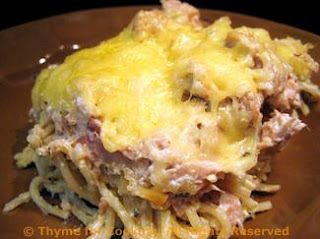 Katie of Thyme for Cooking has been very busy baking cookies, but she still had time to whip up a more diet conscious version of Tuna Spaghetti Pie to balance things out. 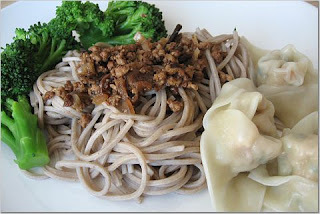 Tigerfish of Teczcape hasn't been around for a while but she makes up for it this week with these lovely soba noodles with pork and won tons. 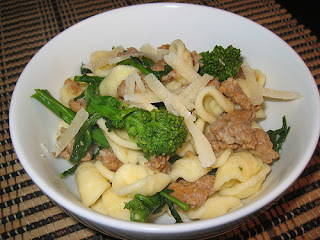 Kevin of Closet Cooking shares another of my favorite dishes...Orecchiette with Italian Sausages and Rapini. 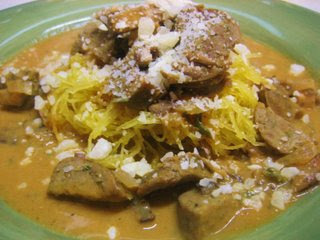 Cara of Cara's Cravings is back with this terrific dish of Spaghetti Squash with Pumpkin Sauce. It's her first as a married woman...lucky guy! 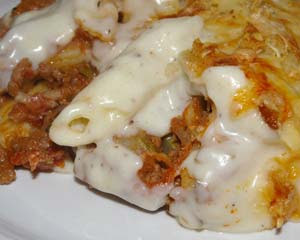 Abby over at Eat the Right Stuff has gone Greek this week with a very flavorful Pastitsio. I can't wait to try it. 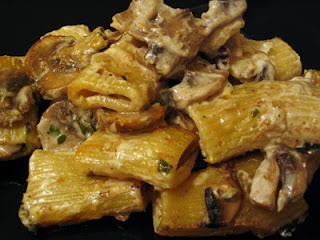 Lisa of Food & Spice shares a most mouth watering plate of Pasta with Goat Cheese and Mushrooms. I'm in heaven just reading the ingredients! Sher of What Did You Eat? has a cellophane noodle thief in her house...and a truly hysterical post. Fortunately, he didn't get the angel hair pasta. 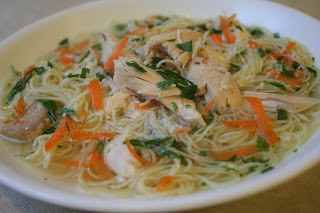 Check out this scrumptious Angel Hair Pasta and Chicken Soup. 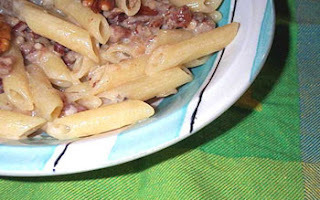 Judith of Think on It shares a very unique combination...Pasta with Gorgonzola and Pecans. It sounds lovely. 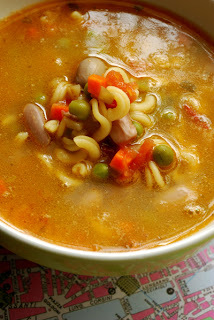 Haalo of Cook (Almost) Anything whipped up a perfect soup for the chilly weather...Ricciutelli Pasta and Vegetable Soup. Do you think I'll be able to find Bortolotti beans here in Halifax? 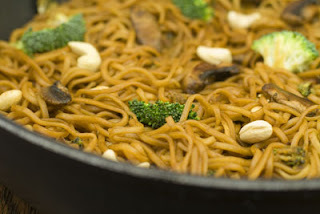 Michelle at The Greedy Gourmet has a fantastic stir fry to share...Broccoli, Mushrooms and Cashew Noodle Stir fry to be exact. And it's amazing. 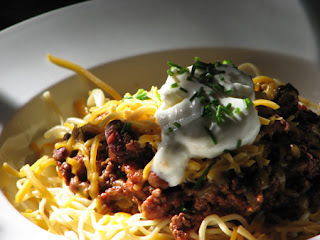 And sneaking in under the wire...Ramona the Houndstooth Gourmet shares this Chili Mac that really takes me back to my childhood in Montreal. We'd go to Piazza Tomazzo (long gone) and this was the only dish I ever wanted! 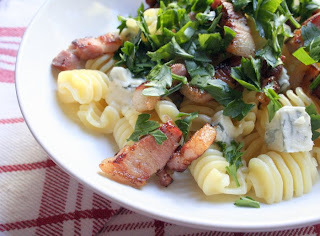 Andreea of Glorious Food and Wine shares her great Leftover Pasta- Bacon, Gorgonzola and Radiatori. Perfection! As for me, well it was a crazy week and my two day headache didn’t help. But pasta is perfect when you don’t feel well and I just whipped up some multigrain Farfalle with some pesto (always on hand) and sautéed some mushrooms and some diced St Tropez Chicken. Delicioso and I’m feeling much better! Perhaps next week I’ll come up with something special. Great round-up - glad you're feeling better! 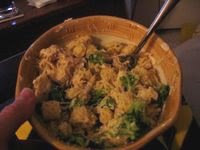 Andreea, as you can see...I've added your delicious "left-over" pasta to the roundup. Thanks for joining in the fun. What's up for next week? Katiez, I'm glad, because I do love getting all these fab dishes every week. Keep them coming! 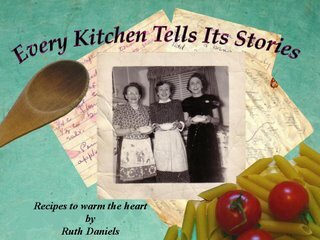 Thank you - Ruth Daniels and all of the entrants - ever so much for the yummy and inspiring recipes! It would be fun to have a giant buffet - let's all wear very loose baggy pants and get started! 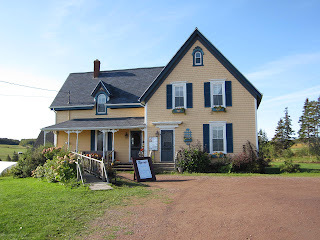 Every time I see the line-up for PPN I think it can't be topped....and each and every week I am amazed by all the creativity and wonderful flavour combinations out there in the blogosphere!! !